2016 FitBloggin & FitSocail sponsors, SWORKIT will be with us for a super fun, energizing and hiney kicking workout this year. Leanna will be leading the class and holding court at the expo. Make sure to snap a selfie with her and share to win a year’s subscription to SWORKIT! I have always been passionate about blogging, actually from the age of 15. I began a personal blog on a website called Xanga, anyone familiar? I shared my troubles with anxiety and my struggles with family problems. Blogging had always got me through my toughest days. As I began to grow, as did social networks and smart phones, my fascination with connecting with others grew as well! You should check out my personal website, here! My goal in life is to help people feel that life doesn’t always have to be hard and to spread positivity. When I wasn’t doing that in person, I found that I could do so with social media. When fitness became an essential part of my life, I found Sworkit. I was looking for a way to switch up my routine and fell in love. I reached out to my now boss, and told him about my love of apps, social, and community. That’s how I ended up the community manager of Sworkit. And that is why I am attending the FitBloggin’ 16 event! I am hoping to meet all of you. I think events like this, where people with similar interests come together, is a time where everyone can be themselves and have fun! I think that we will all be really good friends and that we will have a great time! I hope you join me at 11am on Friday the 22nd! We will be doing a Booty Burning workout and I am going to make you SWEAT. But most importantly, we are going to have a great time doing it! Let’s have fun!!! Also don’t forget to stop by our booth. We will be having fun, taking pictures! 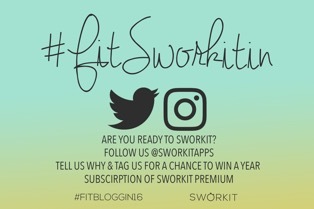 We are even giving away a year subscription if you post a picture with our hashtag #FitSworkitIN, get it?! It’s punny. My name is Leanna and I hope we can get a picture together, learn a little something from each other and do a little bonding!! See you soon! Our app is free! You should download it now since we have a summer workout series going on and it’ll be perfect to get you prepared for the Booty Burning workout!